The 112525WBR Boker Trapper - a classic traditional two blade pocket knife, features clip and spey blades made of Solingen carbon steel with nail nicks for opening. 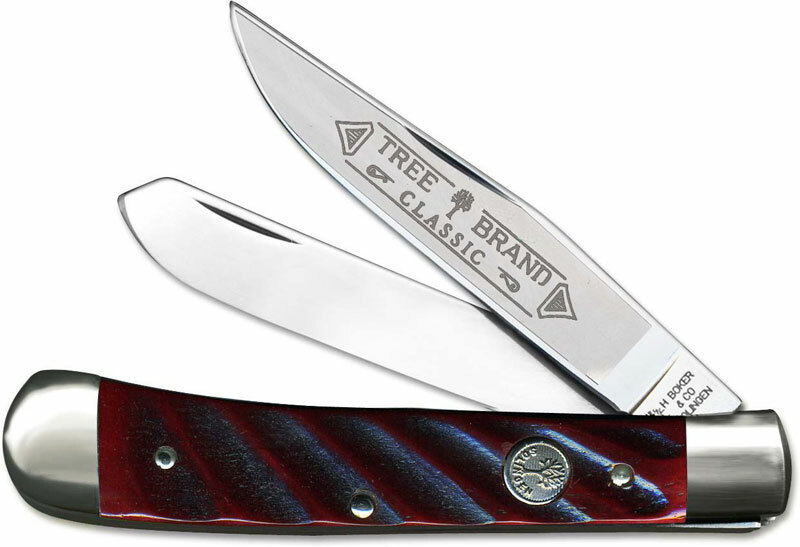 The eye catching Washboard Red Bone handle, 4 1/4 inches closed, has brass liners, nickel silver Tree shield and nickel silver bolsters. Made in Germany; limited run of 100 pieces. Excellent fit and finish on this knife. If your looking for a traditional folder in this pattern, with bone handles and carbon steel, this is one of the most beautiful I have seen. I also have a Boker copperhead with dark red bone that is equally well made. I would not hesitate to purchase any Boker knife, especially those that are made in Solingen Germany. Boker knives are the best! I love and carry one at all times and bought this for my grandson's 12th birthday so he could have one like Grandpa has.